Aphanomyces Root Rot (ARR) is a significant monocyclic seedling disease caused by the fungus-like plant pathogen, Aphanomyces euteiches. The disease afflicts a variety of legumes, including soybean, alfalfa, snap bean, faba bean, red kidney bean, red clover, and white clover, and causes a dramatic reduction in foliage and yields. Currently, there are two different confirmed races of Aphanomyces euteiches that cause ARR on alfalfa, Race 1 and Race 2. 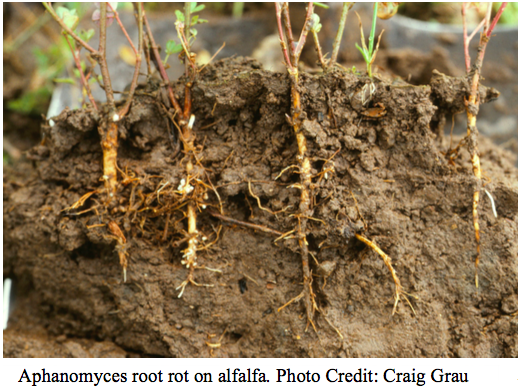 Aphanomyces euteiches infects roots of alfalfa early after seedling emergence. The first symptoms of ARR develop in the roots, which typically consist of a gray, water soaked appearance. The roots eventually lose volume with above-ground symptoms manifesting as a reduction in foliar growth, yellowing cotyledons and the death of the hypocotyls and epicotyls. ARR does not typically result in pre-emergent damping off of seedlings but instead stunted growth, thereby reducing the plant’s ability to compete with weeds. Aphanomyces euteiches is commonly isolated from fields that are poorly drained, including fields that are excessively watered, compacted, or have a large clay composition. Aphanomyces euteiches is spread via water-motile spores that are not visible to the naked eye, and has the same optimal growth environment as its host. Aphanomyces develops survival structures called oospores within dead plant tissue. Oospores are also not visible with the naked eye, and can remain dormant in the soil for as many as 10 years in the absence of a host. The most important step in avoiding ARR is to maintain properly drained fields. Because ARR is caused by a water-motile pathogen, eliminating standing water is important in reducing the proliferation of the pathogen. If ARR has already been diagnosed in a field, a second measure is to use alfalfa cultivars bred with resistance to the specific race of Aphanomyces euteiches present in the field. Identification of the race in a particular field can be determined using a soil bioassay. Contact your local extension office to arrange for the soil bioassay. Cultivars with partial resistance to both confirmed races of A. euteiches are available in Wisconsin. Contact a seed company representative to determine which cultivar is best suited for your location after the soil bioassay has been performed. Use seed treated with Stamina® fungicide if disease present in field. Crop rotations aren’t an effective treatment due to the longevity of the oospores. Rotating with cruciferous green manure crops has been recognized to have some ability to reduce the severity of ARR on smaller scales. Unfortunately, there are no fungicides for established stands, fumigants or other biological control methods that have been effective in decreasing ARR severity.